DR Action Video! Colt IAR (Infantry Automatic Rifle) 5.56mm NATO Mag-Fed AR: Light Machine Gun/Squad Automatic Weapon (LMG) Proposed Replacement Fired on Full-Auto at the Range! | DefenseReview.com (DR): An online tactical technology and military defense technology magazine with particular focus on the latest and greatest tactical firearms news (tactical gun news), tactical gear news and tactical shooting news. All photos and video clips contained in this article were shot by DefenseReview.com (DR), and are copyrighted. DefenseReview.com owns the copyright on these materials. The photos and video clips were shot with a Canon PowerShot S90 10-megapixel digital camera (still camera with video capability). DefenseReview (DR) had a lot of fun shooting the Colt IAR (Infantry Automatic Rifle) at the Camp Atterbury Joint Maneuver Training Center (CAJMTC) firing range at during the 2011 International Infantry & Joint Services Small Arms Systems Symposium, Exhibition & Firing Demonstration Range Day shoot on May 26, 2011. It’s just a fun gun to shoot. The Colt IAR is essentially a 5.56x45mm NATO (5.56mm NATO)/.223 Rem. select-fire mag-fed AR that’s a proposed light machine gun replacement weapon. It operates via direct gas impingement (DGI) and utilizes a heat sink to reduce barrel heating under extended full-auto fire. Defense Review first covered the Colt IAR in late October 2008. The Colt IAR has a pretty high cyclic rate of fire (ROF) that would appear to be in the 900-950 rpm range, causing the weapon to give the shooter a constant solid push backward during sustained full-auto fire. 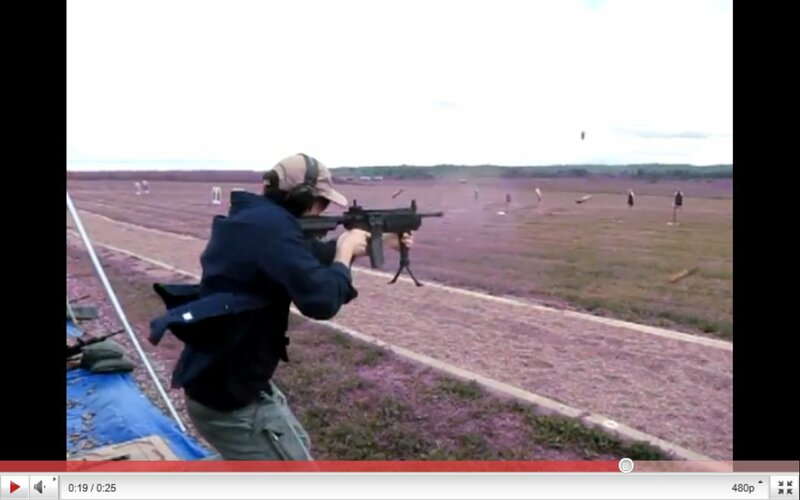 You can see this effect in the second Colt IAR video, below. Muzzle rise during full-auto fire is negligible to non-existent, though. DefenseReview doesn’t know how reliable, accurate, and durable the Colt IAR is under adverse conditions and high round count. DR would be interested in conducting a side-by-side comparitive test between the Colt IAR and FERFRANS HVLAR (High Volume Light Automatic Rifle a.k.a. High Volume Light Assault Rifle), which is gas piston/op-rod-driven and utilizes the patented Ferfrans RRS/DSAS (Rate Reduction System/Delayed Sear Activation System) to lower the cyclic rate of fire (ROF) below 700 rpm for enhanced full-auto controllability and weapon life. Hopefully, we can make the side-by-side comparison test happen, at some point. The Colt IAR and FERFRANS HVLAR can both utilize the new SureFire MAG5-60 and MAG5-100 HCM (High Capacity Magazine) quad-stack box mags, Armatac SAW-MAG (double-drum) and SAW-Lite (drum) mags, MWG 90-Rounder snail drum mag, and any/all 4179 STANAG 30-round AR (AR-15/M16) magazines. DR Action Video! 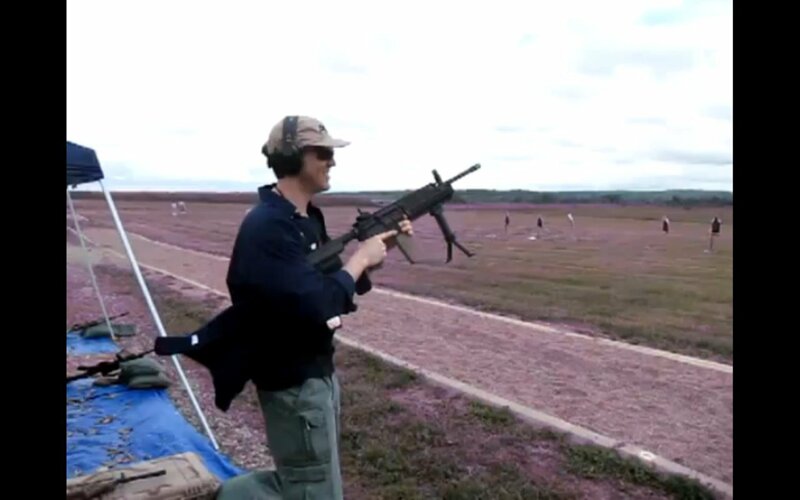 300 AAC Blackout (300BLK) 7.62×35mm Heavy Subsonic/Supersonic Rifle Cartridge-Chambered Suppressed Tactical AR SBR/Sub-Carbine and FN Mk46 MOD1 Fired on Full-Auto at NDIA Infantry Small Arms Systems Symposium 2011 Range Day Shoot: Quiet-Killer Cartridge Impresses at the Range!